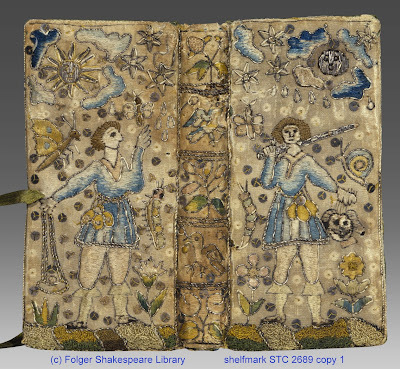 The binding, which is carefully, if not beautifully, embroidered, shows two images of David, one with a sling and other (on the front) holding the severed head of Goliath. I wondered at the implications of this binding. Of course, the battle with Goliath was certainly one of the famous episodes of the psalmist's life, but since the psalms were frequently deployed in the early modern period as poems about the struggle of the righteous against powerful enemies, this episode has a particularly polemical charge. William Gouge uses the Goliath story to argue that David is a type of Christ, who "in like manner did Combat with, and overcame that great Goliah the Devil" (190), and he notes the Goliath story in the margins when he talks about David's "putting forth himself to the uttermost for Gods Church" (188). Given the direction that religious conflict was taking in England in the 1640s, it's also hard not to imagine that this image looks forward to the beheading of Charles I in 1649. In the decade immediately following this event, references to Goliath were extremely common. Usually the story was employed to justify some kind of resistance to the demands of those imagined as more powerful. As I look more closely at the binding (the Folger has a great site for high quality images), I notice the odd selection of creatures floating around David: a caterpillar, a butterfly, a worm, a fly, a bird, and a snail. The rendering of the embroidery reminds me of a child's work, too. Are these creatures are being employed typologically - as images of transformation or the movement of the soul, say? And what does that have to do with the death of Goliath? Or is it a reference to the taunting in 1Samuel17, where David promises to "give the carcasses of the host of the Philistines this day unto the fowls of the heaven, and to the beasts of the earth" (Geneva Bible)? The animals in the binding, at least, are creatures of corruption, as earthly as one can get. I don't think they're just decorative. Time for bed. There's lots more that could be done. Gouge, William. A learned and very useful commentary on the whole epistle to the Hebrews. London, 1655.